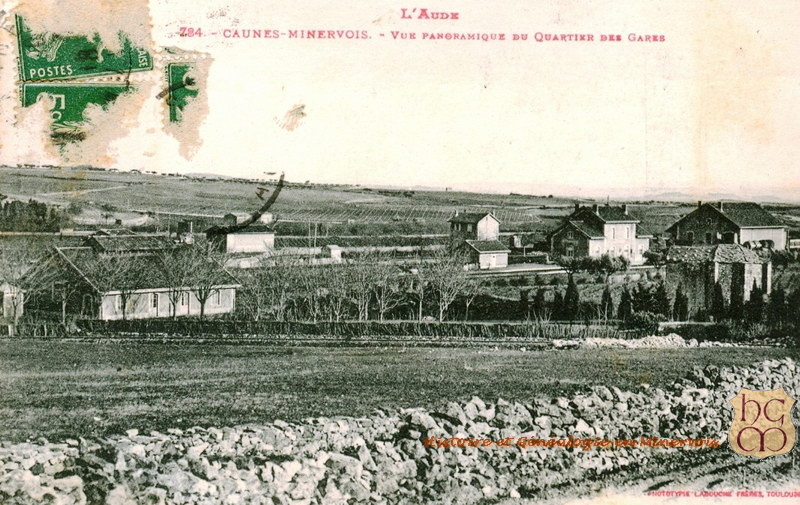 Our journey on the metre-gauge lines of the Tramways de l’Aude continues from the station at Caunes-Minervois. 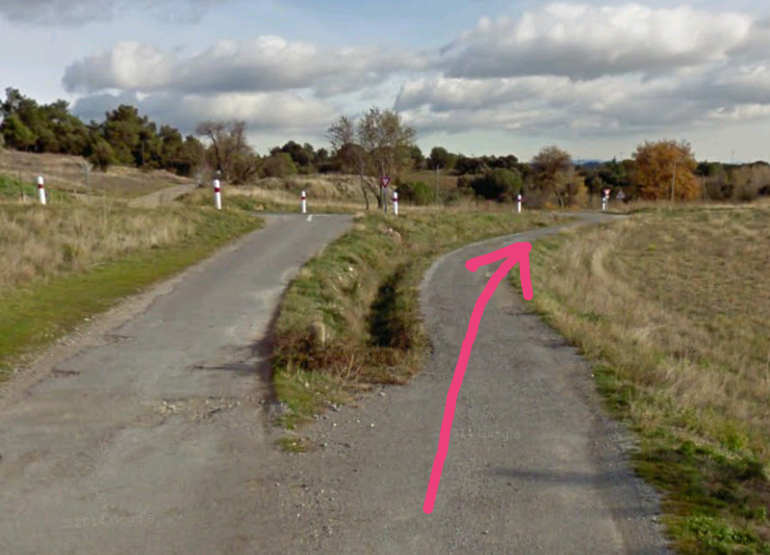 As the plan above shows, the route was tortuous, it certainly wasn’t the quickest route to Lezignan. 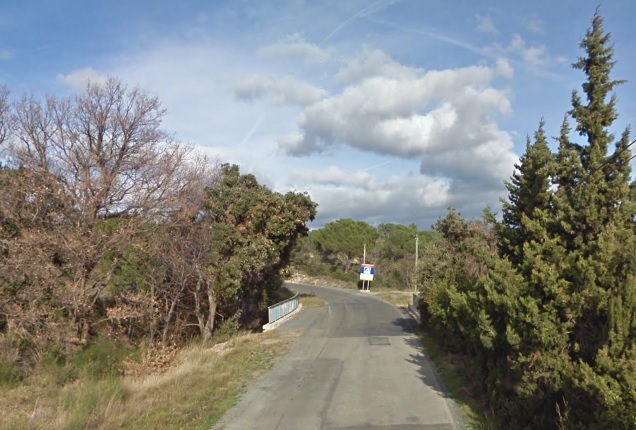 It ran through a good number of the villages in the Occitanie region, including the canton of Les Haut-Minervois, in Hérault and in the Corbières wine region of i’Aude. 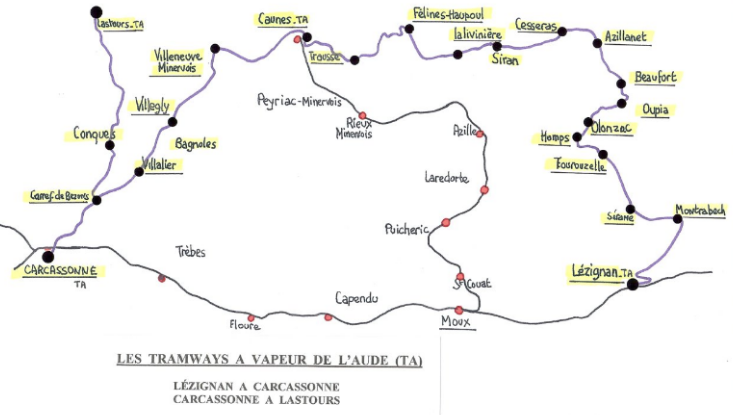 The shorter and faster route would have been to travel from Caunes-Minervois down the standard gauge line to Moux and then along the mainline to Lezignan. Nonetheless we are going to enjoy the bucolic journey by the slower metre-gauge tramway through the French countryside! 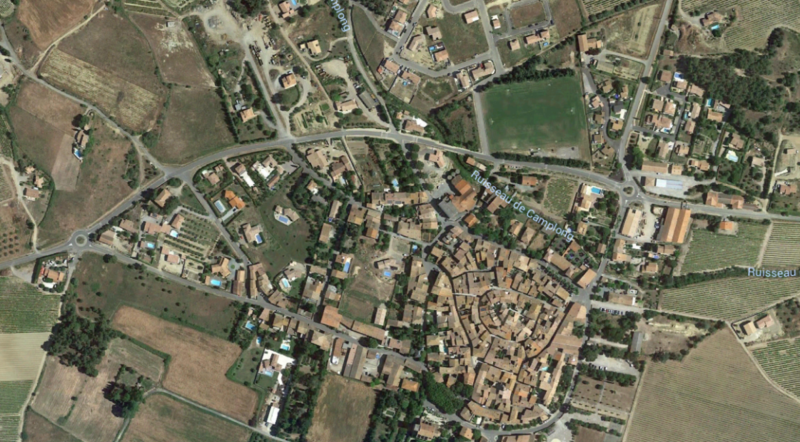 The Featured Image at the top of this post shows the buildings of both stations in Caunes-Minervois. The tramway buildings are to the left of the image, the standard-gauge terminal is featured int he centre-right of the image. 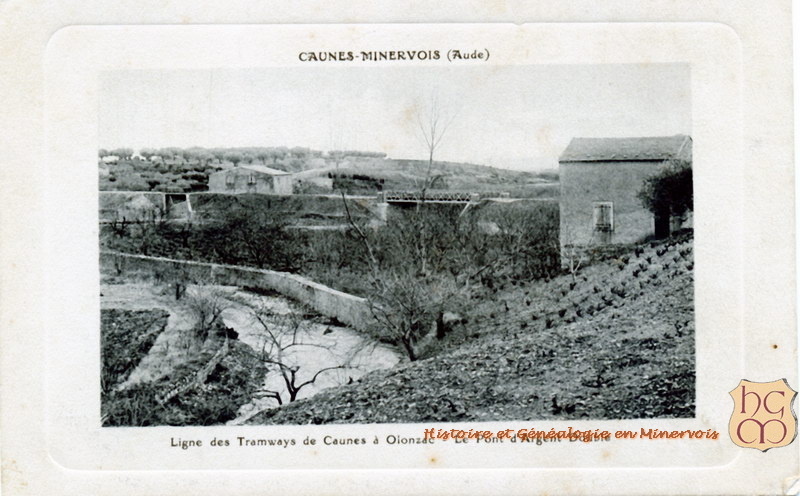 The tramway arrived at Caunes-Minervois on the southern shoulder of the GC8 (today’s D620) and then, just before the centre of the village dropped down towards the standard gauge station, before turning to run parallel to the standard gauge railway for a few hundred metres on its eastern side. The postcard immediately below the map shows the two stations. 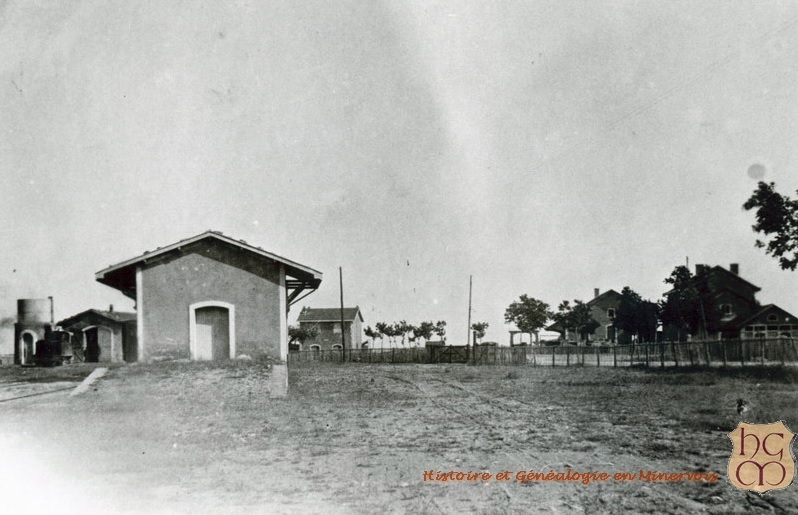 It is taken from the village and shows the Gare du Midi with the Tramways de l’Aude station behind. 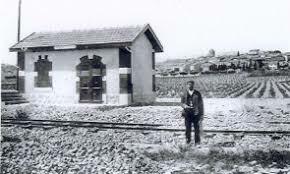 The large building on the right of the photograph is the goods shed for the standard-gauge line. 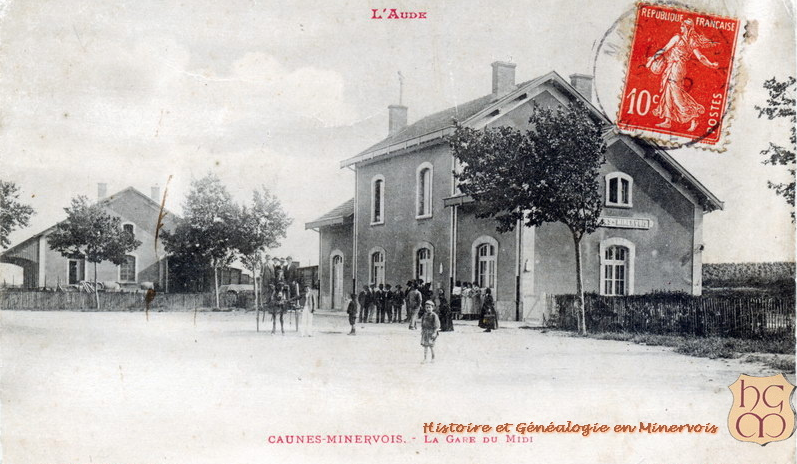 The two pictures above are taken of the Gare du Midi from a similar vantage point to the southwest of the station buildings. 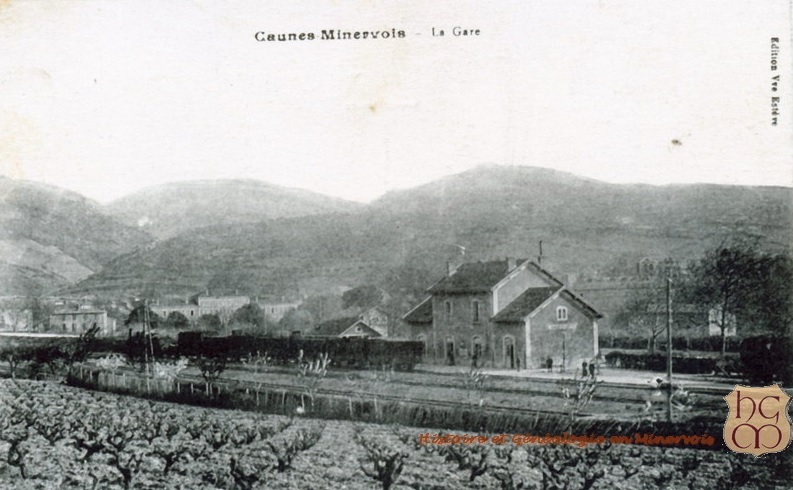 An early view of the Gare du Midi from the same angle but from a greater distance. This view shows the same building but from the station yard rather than trackside. This view is taken from the village looking towards both stations. 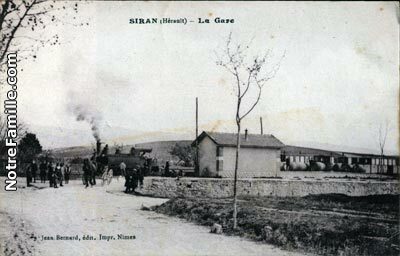 The Gare du Midi and its goods-shed are almost hidden by the trees but the facilities at the Tramways de l’Aude station and much more in evidence. The goods-shed is in the foreground with the passenger station building to the right and the engine shed and water tower to the left. 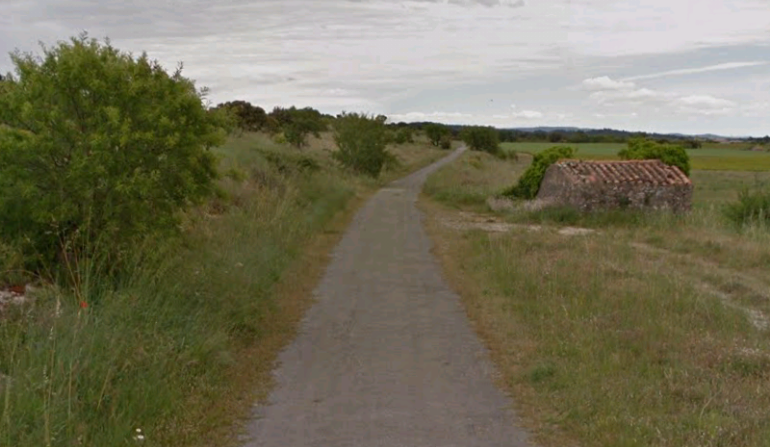 This modern image from Google Streetview is taken from the North and shows the two station buildings still in use. 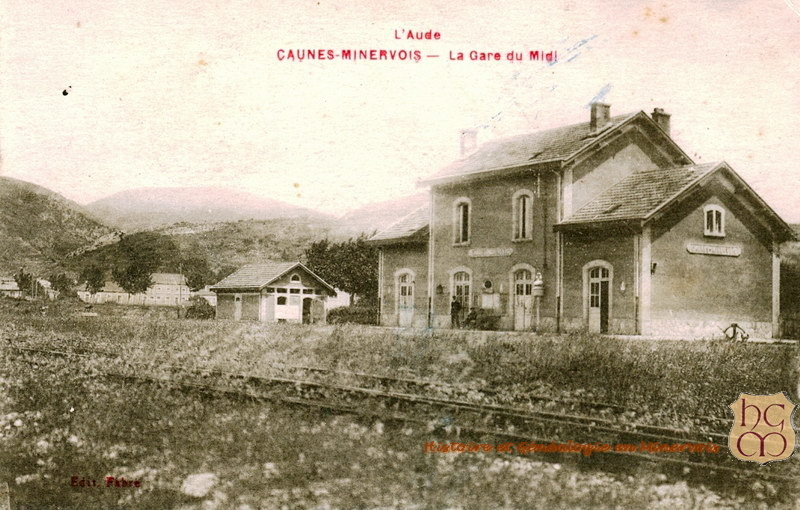 On the right is the Gare du Midi used now as a marble workshop. 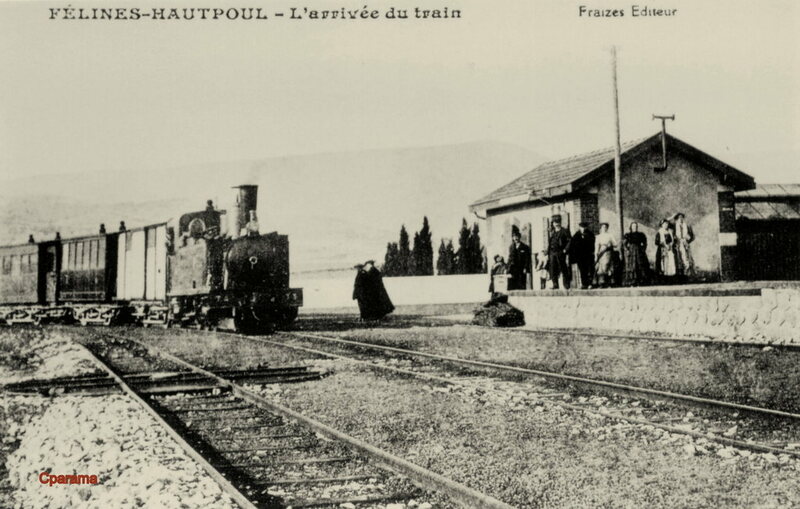 On the left is the Tramways de l’Aude station building in use as a private home. 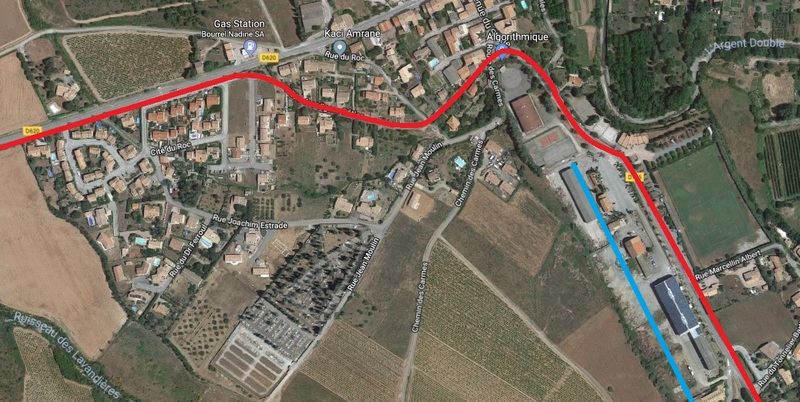 Here we have an approximate alignment for the route of the Tramways de l’Aude line through Caunes-Minervois (in red) and the standard-gauge Ligne du Midi which terminated in the village (in blue). 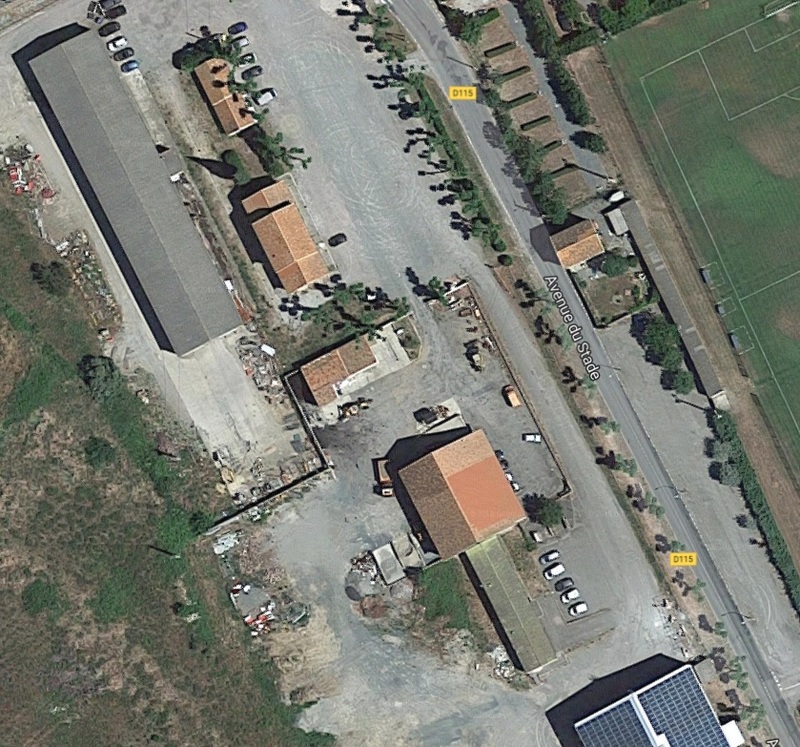 The satellite image above shows the proximity of the two station buildings. The present D115 follows the line of the old tramway. The tramway route can easily be picked out on the 1930s Michelin map above. 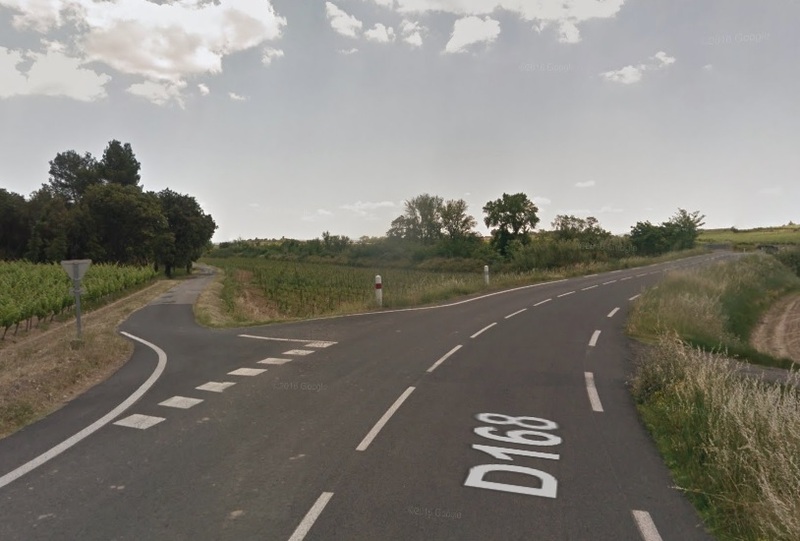 After finding its own way through the countryside, it joined the GC115 about halfway between Caunes and Trausse. 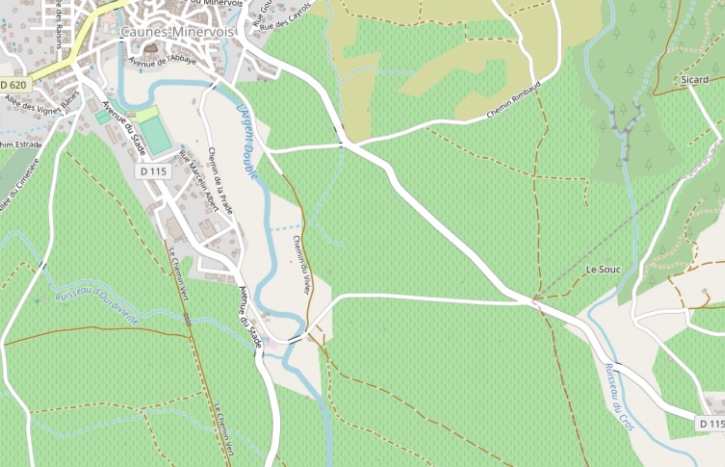 On the modern OpenStreetMap image below its formation is under the D115, Avenue due Stade heading south of the village before it follows what is now a minor road and bridges the River Argent Double travelling East to join another arm of the D115. The tramway left the shoulder of the western arm of the modern D115 and turned down the minor road in the image above. 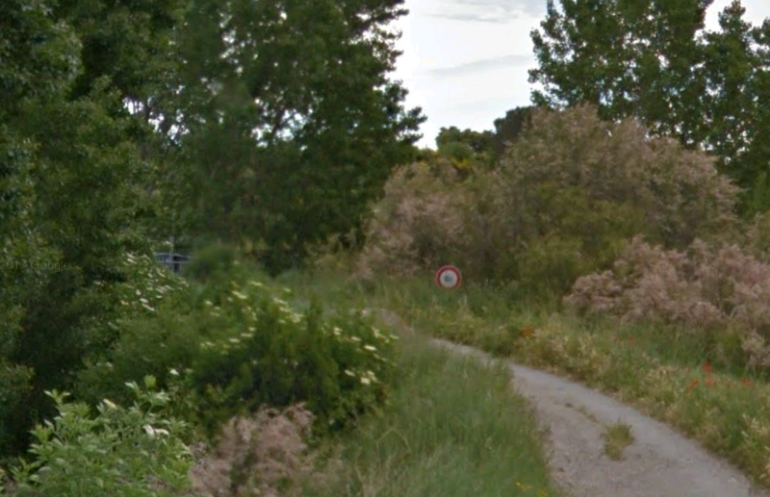 This is as far down the minor road that that has replaced the tramway that Google Streetview will take us. 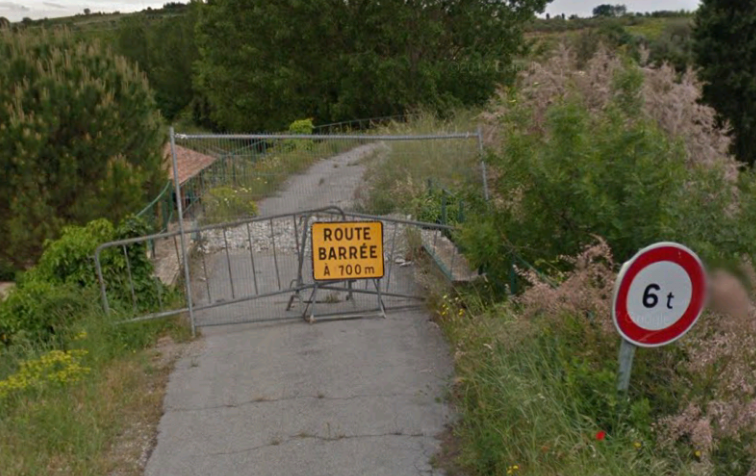 The bridge over l’Argent Double can just be glimpsed ahead. The sign is a weight restriction sign. 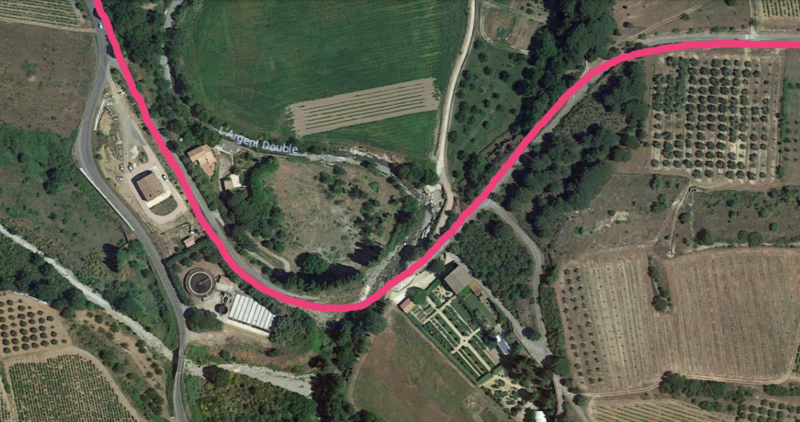 The pink line approximates to the tramway alignment. The bridge which used to carry the tramway has gone – it appears that this has been due to neglect and flooding. Historic satellite images on Google Earth show that the route was eroded to the East of the bridge before the bridge itself failed! The view above is from the tramway route to the East. The adjacent image shows the bridge before it was lost and appears to have been taken from the South. The image below shows the two bridges at this location from the North. The tramway formation has been used to create a minor road which runs from the bridge to the eastern arm of the D115. The old formation is only lightly tarmacked. At the junction with the D115 the modern road forms a right-angled junction but the tramway route curves to the right. and follows the D115. There is one deviation from the modern D115 before we reach Trausse. It is shown below. 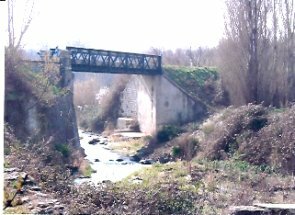 The old rad/tramway cross the Ruisseau du Cros almost at right-angles on an old arch bridge. 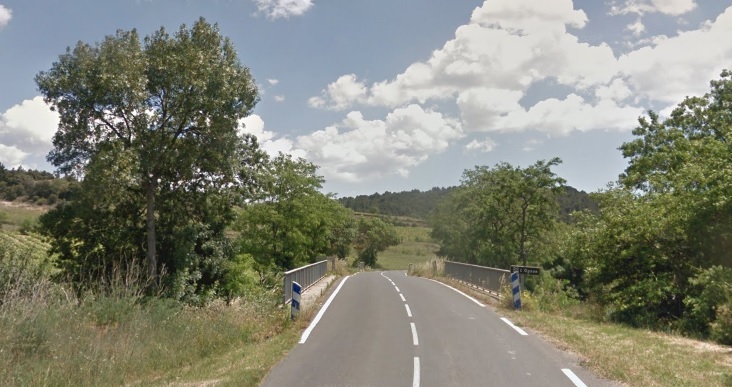 The newer road has its own bridge. 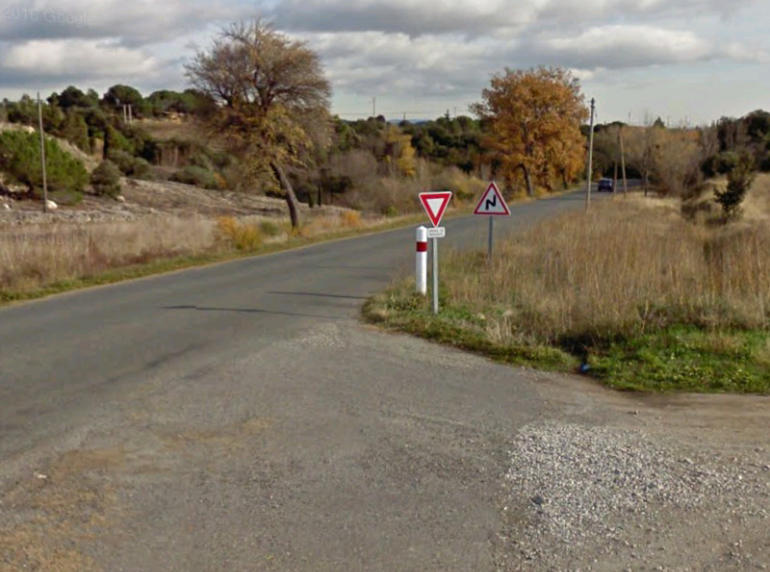 In this image the road bearing to the left is the route into the village and that bearing right is the modern D115 and the route of the old tramway. The tramway ran round the south side of Trausse. The village of Trausse is pleasantly set in the middle of vineyards close to the boundaries of the Aude and Herault, in the foothills of the Cevennes. The village was once fortified. There are still many vestiges of the 9th century ramparts. 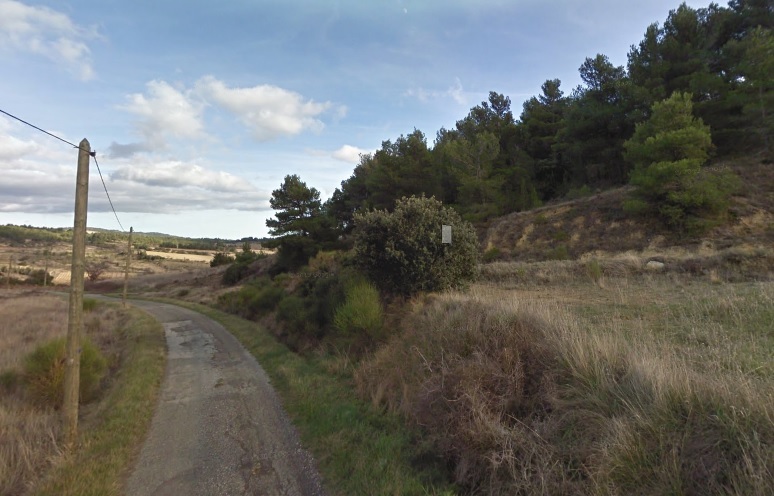 https://en.m.wikipedia.org/wiki/Caunes-Minervois, accessed on 7th October 2018.
http://album.minervois-gen.org/index.php?/categories/posted-weekly-list-any-35-6/start-120, accessed on 8th October 2018.
https://www.cparama.com/forum/caunes-minervois-aude-t24644.html, accessed on 8th October 2018.
http://cahiers.de.minerve.pagesperso-orange.fr/HTML/cdf_lezignancarcassonne.html, accessed on 24th September 2018.
https://www.cparama.com/forum/felines-hautpoul-ou-olonzac-t26747.html, accessed on 9th October 2018.
https://www.communes.com/cartes-postales-anciennes-siran-34, accessed on 9th October 2018. 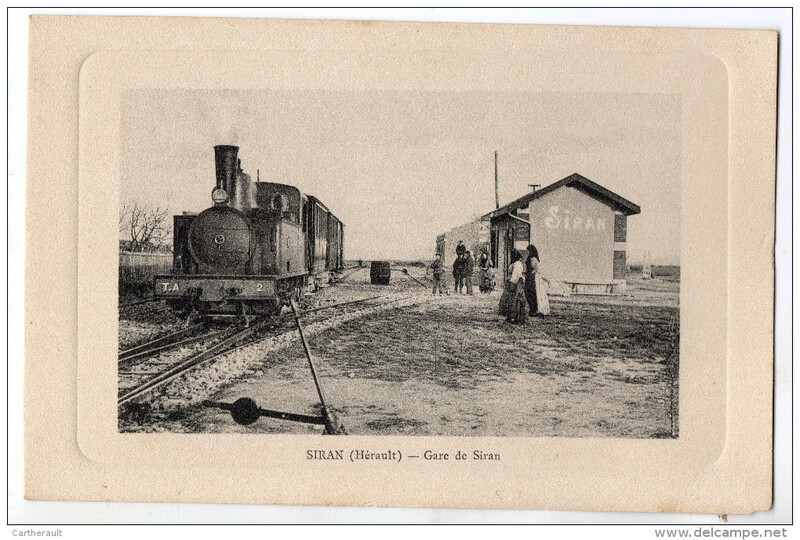 This entry was posted in Railways and Tramways of South-Western France, Railways Blog on October 9, 2018 by rogerfarnworth.